Boston weekend getaways are all about sightseeing, history, and lots and lots of seafood! 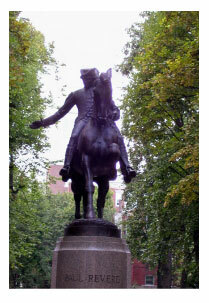 Boston is a very walkable city and it's very easy to get around, whether on foot or by subway. Getting to Boston is quite easy; even if you are flying (into Logan Airport), there are plenty of non-stop flights from around the country. You shouldn't have to spend all day getting here! And, of course, there are interstates coming directly into town; Boston is not that difficult to navigate and find your hotel. Getting around Boston is a breeze, too. If you fly in, don't bother with a car rental - the "T" (subway system) is cheap and easy and will get you where you need to go. Your Boston weekend getaways start with a nice hotel located near the things you want to do. 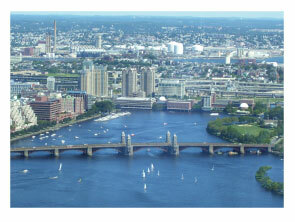 There are hotels in Boston in every price range; and with the "T" in every neighborhood, most are conveniently located. For an inexpensive hotel near the Prudential Building, try the Midtown Hotel . I stayed here last year, and while it's not much to look at, it's clean and comfortable, and located just a couple of blocks from the "T" station in the Pru. It's also across the street from Christian Science University, which has a lovely park-like setting with a reflecting pool. 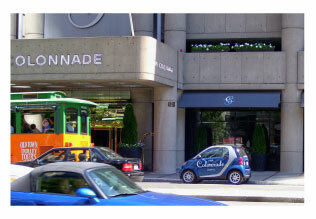 Down the street from the Midtown, directly across the street from the Pru, is The Colonnade Hotel. The hotel recently enjoyed a complete renovation, it couldn't be more convenient to the "T", shopping, Fenway Park, and Symphony Hall. I took this photo of a MiniCooper parked outside the hotel because I thought it was funny - I hope this isn't their airport shuttle! A more upscale hotel that comes highly recommended is The Lenox Hotel. It's not far from the Midtown, but it's a lovely, old-world boutique hotel with modern amenities. 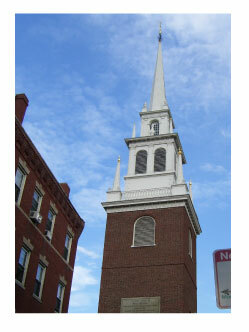 It's near historic Trinity Church and shopping on Newberry Street. Compare prices on all Boston hotels and read what other travelers have to say about them at TripAdvisor. Boston is a great city for sightseeing and, of course, for history. You can start your Boston weekend getaways with a "Hop-On-Hop-Off" tour. I love these - you get a trolley pass (usually for 24 hours), and you can either take the whole route at once for a brief overview of the city, or get off at any of the stops, take your time looking around, the hop on the trolley again to the next stop. Some of the tour companies include a short harbor cruise, too. The "T" is also a great way to get around; start at the Prudential Building if you're at any of the above hotels, and take the "T" to Faneuil Hall (shopping and restaurants) and the North End (Little Italy), Chinatown, or Fenway Park. "The Pru" is also a nice place to start your city sightseeing. The view from the top is incredible! And the audio tour gives a good historical and cultural background to further explorations. There is so much more to see in Boston weekend getaways, too - Trinity Church, Chinatown, Little Italy, the Rose Kennedy Parkway over the "Big Dig" - there is a lot of history in a small geographical area! If you love food (and who doesn't), take the North End Market Tour of Little Italy. I'm not a cook, but I loved this tour - they'll take you to several markets and bakeries and explain how the items you find there are used in traditional Italian cooking. And you get to taste! I had a great time and I highly recommend this tour. They also offer tours of Chinatown; you can explore on your own and have a nice lunch, but these tours are fun and informative. One of my favorite things to do in any city is taking in a show - whether it's the local regional theater, a comedy club, or a concert, I enjoy these events at home and love to see what's going on in other cities. 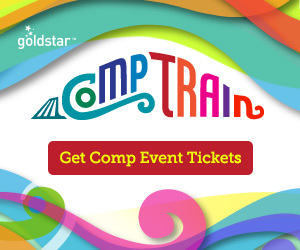 You can get half-price tickets to theater, concerts, comedy and sports during your weekend getaway with Goldstar. Just sign up for half-price offers on tickets and lots more! If you're going to Boston, I hope you love seafood! Boston weekend getaways are best if they focus on food. There are so many great restaurants in Boston and not all are seafood restaurants - but you really must have a lobster, crab, or chowder. The Union Oyster House is one of the most famous Boston seafood restaurants; I greatly enjoyed my meal here, but I have to say I think it might be a bit overpriced. Still, it's not a trip to Boston without the Union House. Legal Seafood is also good; there are several restaurants in Boston and beyond, but it's not a typical chain. I ate at the one in the Prudential Center. The food was quite good! But for lobster, try to find an off-the-beaten-path place on the harbor or in a nearby town. "NoName" restaurant (which was truly a no-name place the first time I visited Boston) has become quite popular; still, it's good and less expensive than the "white tablecloth" restaurants. And if you get out to Essex, Woodman's is great - good, cheap lobster served in a paper tray. Yum!!! And, of course, check out the North End for great Italian food, as well as Chinatown. And the Flour Bakery has the best pecan sticky buns in town! Just like Mom's - really! To take some of the sting out of the prices, Buy Restaurant.com Gift Certificates! You can purchase a $25 certificate for $10 (or as little as $2-3 when they're having a sale) - buy a couple before your trip and you can save a bundle! Boston is a great city for a weekend getaway, all year long. For tips on enjoying the city in the colder months, check out Winter Fun in Boston - lots of great tips! Boston weekend getaways are the perfect escape - there's something for everyone!